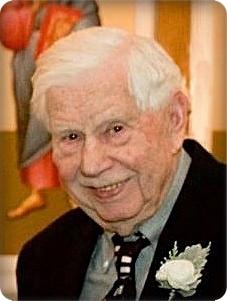 On Wednesday, April 3, 2019, Harris M. Van Singel, age 96, of Dorr, MI, formerly of Byron Center, went home to be with his Lord. Harris proudly served in the Air Force during World War II as a top gunner on a B-29 Bomber. He was preceded in death by a son, James Van Singel; brothers, Willard Van Singel, Robert Van Singel; and step-sisters, Jeanette Elzinga and Glady Alles. He will be lovingly remembered by his wife of 74 years, Connie (Vander Werf); his children, Larry (Juanita Schierbeek) Van Singel, Ronald (Fayth Alles) Van Singel, and Sue (Bruce) Walcott; grandchildren, Monica (Keith) Van Wienen, Jeff (Amber) Van Singel, Brandon (Mindy) Van Singel, Ronald (Erika) Van Singel II, Wynnelle (Steve) Witte, Amanda (Dan) Pluger, Stacey (Jimmy) VandenBerg, Jason Walcott; 22 great grandchildren; brother, Gordon Van Singel; brother-in-law, Roger Zeeff; several nieces and nephews. Harris and Connie are charter members of Second Christian Reformed Church of Byron Center (7588 Byron Center Ave. SW), where the funeral service will be held 11 am Tuesday, April 9, with Pastor Adam Nordyke officiating. Interment will be in Winchester Cemetery. The family will greet relatives and friends on Monday from 5 - 8 pm at Stroo Funeral Home, and on Tuesday from 10 - 10:45 am prior to the service at church.